Richard Gottlieb Reuther (1860-1913) was born in Detroit in January 1860. Reuther’s father, Gustavus, entered into a contract with Julius Melchers in 1873; Richard later became a student of Melchers. In 1882, Reuther & Company was formed with partners Richard Krakow and Joachim Jungwirth. In 1885, Reuther formed a partnership with Edward Wagner. 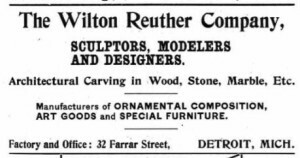 In 1899, their company became The Wilton-Reuther Company with the addition of Leonard Wilton. In 1905, the partnership again changed and operated under two distinct companies: Florentine Art Company and the Architectural Contracting Company with Reuther, Krakow, Alexander G. Poli, and Allessandro Orsetti as the principles. By 1907, Reuther was doing business as Florentine Art Company with a new partner, Otto Liepold. Reuther was a member of the Kilwining Lodge, Masonic Temple Association. He is buried in Elmwood Cemetery. The Richard G. Reuther Papers are located at the Archives of American Art.